Looking for your first manufacturing engineer job? This sample resume shows how to emphasize your education and knowledge to break into the field. Are you looking for your first manufacturing engineer job? To be a successful candidate for manufacturing jobs, resume expert Kim Isaacs says it helps to have a comprehensive resume. 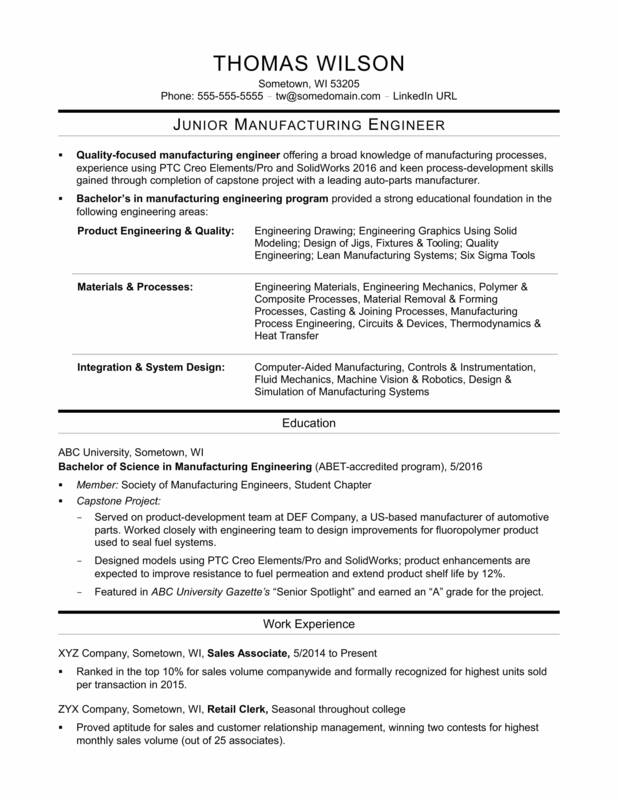 To learn how to emphasize your education and knowledge to break into the field, view this sample resume for an entry-level manufacturing engineer that Isaacs created below. You can also download the entry-level manufacturing engineer resume template in Word. And if you need more help, let the experts at Monster's Resume Writing Service create a high-impact resume for you that will impress employers. Jobs for manufacturing engineers are projected to grow by 10% (or 25,100 jobs) from 2016 through 2026, according to the Bureau of Labor Statistics (BLS). You’ll find the highest level of employment for this job in the following states: Michigan, California, Texas, Ohio, and Illinois; and in the following metropolitan areas: Warren, Michigan; Minneapolis, Los Angeles, Chicago, and Detroit. Additionally, you can learn more about manufacturing careers and engineering careers, and search for manufacturing engineer jobs on Monster. Quality-focused manufacturing engineer offering a broad knowledge of manufacturing processes, experience using Creo Elements/Pro and SolidWorks 2010 and keen process-development skills gained through completion of capstone project with a leading auto-parts manufacturer. Served on product-development team at DEF Company, a US-based manufacturer of automotive parts. Worked closely with engineering team to design improvements for fluoropolymer product used to seal fuel systems. Designed models using Creo Elements/Pro and SolidWorks; product enhancements are expected to greatly improve resistance to fuel permeation and extend product shelf life by 12%. Featured in ABC University Gazette’s “Senior Spotlight” and earned an “A” grade for the project. Ranked in the top 10% for sales volume companywide and formally recognized for highest units sold per transaction in the first quarter of 2015. Proved natural aptitude for sales and customer relationship management, winning two contests for highest monthly sales volume (out of 25 associates).